Why many companies inevitably deprioritize employee development could be the subject of endless debate. 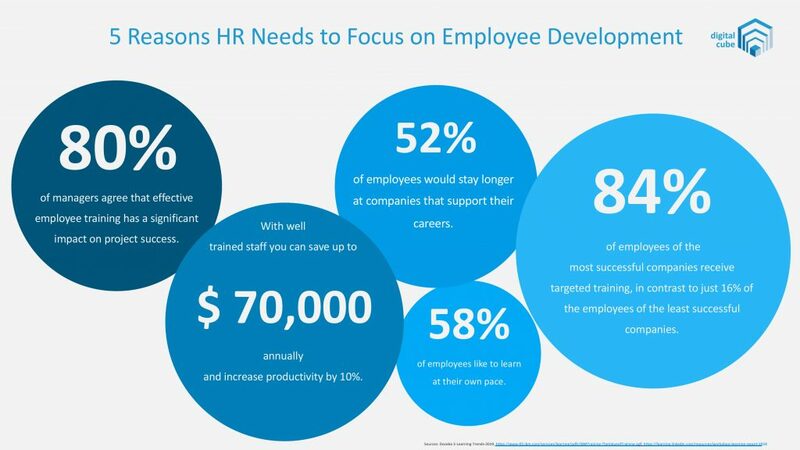 Yet the facts and figures on employee development remain unchanged. They provide future-oriented companies with more than enough incentives to focus on employee development. Companies frequently make their first mistakes during onboarding and training for new hires. Learning content must be accessible in a way that allows them to learn at their own speed. This means providing 24/7 access to the information, which can be reviewed at any time. Since 58% of employees prefer to learn at their own pace, companies that do not offer this opportunity have already made the wrong impression. Next, the content must suit the specific needs of each new hire. Too much general information frustrates new hires. They will quickly get the impression that efficiency is not a company priority. Moreover, they will get the idea that their new company lacks the proper planning and management to target and customize their training. In fact, at the most successful companies, 84% of employees receive targeted training. On the other hand, this figure is only 16% at the least profitable firms. How employees view their organization makes a huge difference in the long run. If employees feel that their company supports their personal career goals, 52% of them will plan to stay longer with the company. This means that firms that do not miss a tremendous opportunity to retain competent workers. A well-trained staff can not only increase productivity by up to 10% annually, but it can also save companies up to 70,000 US dollars each year. By using digital tools and the latest technology to unlock its greatest potential, well-trained workers can achieve more in a shorter period of time. 80% of managers agree that effective employee training regularly has a significant impact on project success. Not only do successful projects make a big impact on the bottom line at the end of the year, but they keep your workers satisfied doing their daily tasks. Everyone wants to be part of a winning team. The numbers speak for themselves. With cutthroat competition from increasingly digitalized competitors, there is no more time for pointing fingers. Because PDAgroup can quickly provide your company with an employee development e-learning platform, the Digital Cube, there is no longer any excuse for your company not to offer your employees proper development opportunities. 58% of employees like to learn at their own pace. Companies that don’t facilitate learning at any time from anywhere will fall behind. 84% of employees receive targeted training at the most successful companies in contrast to just 16% at the least successful companies. 52% of employees would stay longer at companies that support their careers. $US 70,000 is how much your company can save annually thanks to the resulting 10% boost in productivity. 80% of managers agree that effective employee training regularly has a significant impact on project success. You can analyze the maturity of your digital learning activities for free here. Contact Dietmar for more about employee development. Follow us on LinkedIn if you liked this article.